The headquarters of Radio Nicaragua, state radio station of the Central American country, was attacked and destroyed by a fire in the early morning hours of June 8, according to local press reports. The attack adds to similar attacks against media outlets in the country that have occurred since April 19, when protests against proposed social security reforms, and later the government of President Daniel Ortega, began. According to a report published on the radio station’s website, a group of armed people invaded the radio facilities around 4 a.m. (local time in Managua, the Nicaraguan capital, where the radio station is located) firing shots. The three employees who were on the radio at the time said the invaders stole computers and equipment and then used Molotov cocktails to set the building on fire. Radio Nicaragua accused "an organized delinquent group operating in the facilities of UNAN Managua" to be the perpetrators of the attack. 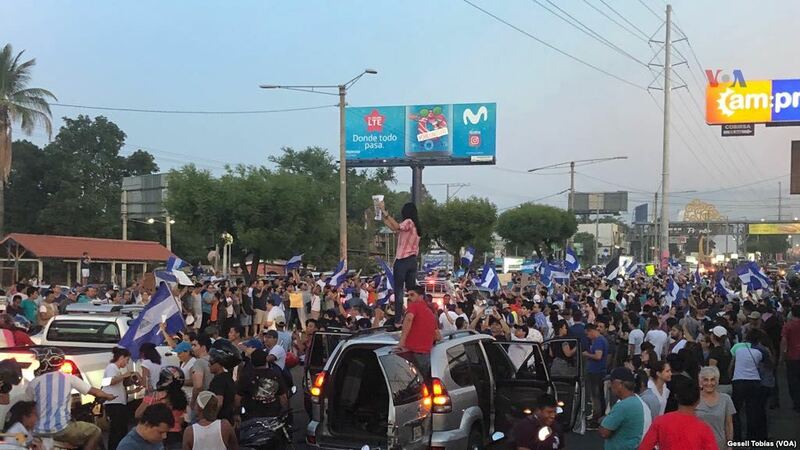 The National Autonomous University of Nicaragua (UNAN) is located a few blocks from the radio station and is occupied by students who oppose the Ortega government, according to El Universal. However, the students denied the charge, according to Vos TV. According to La Prensa, the same morning of the fire, a group of paramilitary supporters of the government started firing at a barricade erected by students in the vicinity of UNAN. Two students were shot and one of them, 19, died on the way to the hospital. The Nicaraguan Center for Human Rights (Cenidh) has confirmed the student's death and said that the death toll in protests since April 19 has reached 135, La Prensa reported. One of them is journalist Ángel Gahona, shot in the head while broadcasting a protest live via Facebook on April 21 in Bluefields, in the east of the country. Radio Nicaragua was founded in 1961, according to the radio station, and the published photos report the near-complete destruction of the facilities and equipment. Additionally, in the last two months, armed people attacked the studio of Radio Darío with the use of fuel and mortars on April 20; the headquarters of Tu Nueva Radio Ya, on May 29, set on fire with Molotov cocktails; and the newsroom of channel 100% Noticias channel, on May 30, attacked with stones. Amnesty International, the Inter American Press Association (IAPA) and the Gabriel García Márquez Foundation for New Ibero-American Journalism (FNPI) are among the organizations that condemned the violence in the country in recent weeks.